An electronic meter for reflective measurement with angle of view 50°, with CdS sensor, and with analog exposure calculator for film speeds ASA 8 to 3200, shutter speeds 16 to 1/2000 seconds and apertures ƒ1 to ƒ32. The measurable light values 1 to 19 EV are represented as letters A to O on the instrument scale which is switchable from the lower scale A to H to the upper scale upto O. It needed a 1,3V Mercury cell (type 625). 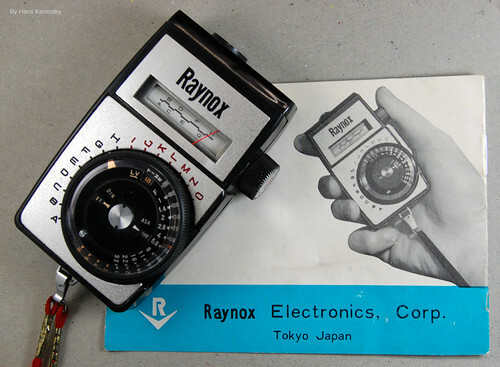 Raynox Electronics, Corp. was a Japanese maker of lenses and light meters. It offered lenses since 1963. In the last years it offered a great variety of converter lenses for digicams and some other special accessories. They had some basic point and shoot cameras manufactured in China and Thailand. This page was last edited on 10 December 2014, at 22:22.